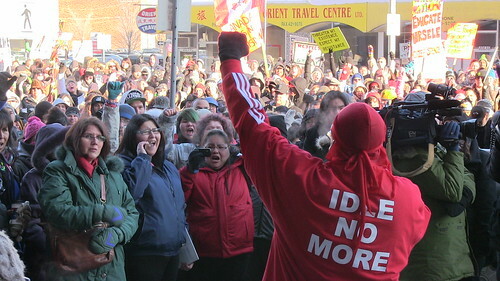 The Idle No More movement has been making waves in the media since its first day of action on December 10, 2012. Since then, flash mobs, round dances, marches, rallies, and other forms of protests have been springing up all over the country - and beyond. Support for this grassroots, Indigenous movement is coming from our neighbour to the south as well as overseas. Whether one agrees or disagrees with the motivation behind Idle No More, or the tactics being employed, the movement has become an unqualified success. I have attended a number of INM events as an ally and citizen media reporter and witnessed first hand how well-organized and well-attended they are. As a community organizer in the peace movement, I would dare to say that those of us who are activists have a lot to learn from INM in very practical ways. Here is a list of reasons why INM is working so well - and what we can learn from it. Organization: The events are well-organized. Speakers are contacted well ahead of time. Events start at the advertised time and end within a reasonable amount of time. Things don't drag on. This is especially important with winter outdoor events. Social Media Revolution: INM a social media revolution. Facebook and Twitter are being used to their maximum potential to promote events. The crowds are rife with people taking pictures and videos, posting them online afterwards on YouTube, Flickr, Facebook, and Twitter. If you are online at all, INM cannot be ignored. Media Connections: There has been lots of media at INM events. This can be attributed to the fact that news of these events get around quickly (see above) and also it is important to have an up to date media list with press releases sent out in a timely fashion. I can't say for sure that this is what has been happening, but the results speak volumes. At first it was like pulling teeth getting media out to INM events- it was almost like there was a media blackout. Now they come out in droves. Yes, a lot of the reporting is a smear campaign, but some of it is balanced, and some even in favour. As well, never discount the importance of citizen media. Attitude is Everything: The atmosphere at many INM events is welcoming, warm, and inclusive. Organizers take the time to speak with people attending, especially "settlers" and allies from other organizations. A major statement of the INM movement is that Bill c-45 is not just about Aboriginal issues - it affects all Canadians, regardless of race. Hey - clean water is important to me and I am a first generation Canadian. Momentum: A priority of INM seems to be keeping its issues in the public eye and up for discussion. Organizers are tirelessly planning the next event, event after the drums and cants from the previous ones are still echoing. Variety: INM events include rallies, speeches, round dances, flash mobs, drumming, singing, chanting, and speakers - sometimes all within the same event. This keeps things from getting dry and losing audience attention. Leadership: One of the reasons why Occupy fell apart in some places, was the lack of clear leadership. Too many people were going off in different directions or trying to co-opt the movement for their own purposes. While the leadership in INM is not strictly formal, there appears to be groups of organizers regarded as leaders through whom decisions are made concerning event planning. Again, this appears to be a very inclusive process, with people being able to bring concerns and ideas forward. R-E-S-P-E-C-T: While many ethnic and social groups are fragmented by politics, the people involved with INM appear to respect each other - even when they disagree. Case in point: an elder disagreed with the location of a major INM event and expressed why. Although the event took place as planned, it led to dialogue and an understanding of that person's perspective. Focus: When I attend an INM event, I come away with a clearer idea of what the issues are. Many have dealt with Bill C-45. Some are specifically to support Theresa Spence. These are not rallies for the sake of having rallies. The shorter events, like the flash mob round dances, are more for raising awareness and getting attention.